In my last blog, I talked about three sculptors who have found their artistic expression in three-dimensional art. All of them said that they love the feel of creating art in a tactile way. You could say the sense of touch is an integral part of their work. To continue this theme, I talked to three other 3D artists who display at the gallery. The first two are ceramicists, whose tactile expressions are revealed directly in their art. The third is a glass artist, whose journey to a finished piece is a little more complicated. For her sculpture entitled “Quail on a Rock,” she uses a horseshoe nail to create the quail’s topnotch. Always on the lookout for found objects, Michelle likes to mix up her mediums. For her sculpture “Guardian,” she re-finished an old shutter door, added trim where the hinges had been and created a ceramic bas relief to depict the wolves as “animal spirits of the forest.” Although it’s meant to be hung on a wall, this piece still offers the texture and depth of three-dimensional art. 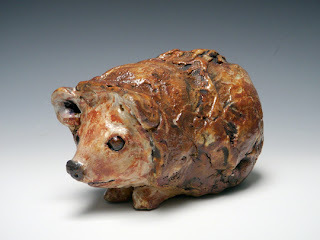 Although Tom Philabaum had a natural ability to draw and paint as a child, his initial pursuit in college was academics, But when he decided to take a ceramics class, he says “the clay grabbed me.” Tom focused on hand building, working in such a large scale that his instructor told him that his ideas were too fluid for clay, and that he should try glass. A chance meeting in Wisconsin with Harvey Littleton changed the course of Tom’s artistic career. (Littleton and glass scientist Dominick Labino introduced glass as an art medium in 1962, and Littleton taught the first glass-blowing class in an American college at the University of Wisconsin-Madison.) Tom was drawn to the expressive possibilities of glass, and, under the tutelage of Harvey Littleton, was encouraged to push the boundaries of artistic expression in that medium. He started to work with glass in the same way he had worked with clay: by creating shapes and constructing objects with them. “I use heat instead of water to make the material flow,” he explains. You can see the unique way Tom fashions glass in his rock sculptures, made of blown glass and fashioned together. 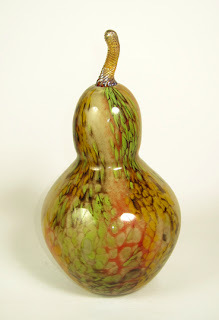 In pieces like “Small Gourd” and “Round Paperweight”, the balls of glass appear to be floating, yet delicately attached. The shimmering, multi-colored hues of the sculptures look so ethereal. 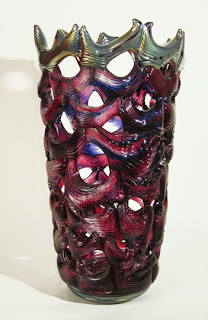 A recent exploration has led Tom to a fusion of glass making and painting. 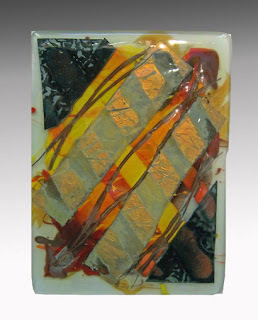 “River Road” is an example of his fused glass collage painting series. In this multi-step, complex process, 2D and 3D have a chance to meet!